In this painting by Gordon Bennett issues of aboriginal identity, custody and ownership are addressed. 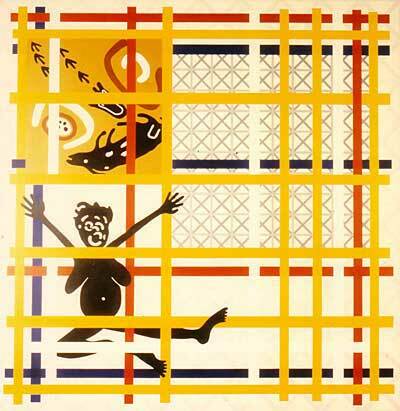 To frame these concerns, Bennett has appropriated grid systems from Mondrian and the De Stijl movement and, with the aid of computer technology, has used them to contain the central figure. The figure relates not only to custodial matters but also to the title’s familiar phrase ‘a dingo stole my baby’ and the controversial stolen generation. A deliberate reference above the figure to Margaret Preston’s decorative style, in itself borrowed from indigenous painting, reinforces the concept of aboriginal art as viewed through a western historical framework and situated within a wider socio-political context. Gordon Bennett was born in Monto, Queensland in 1955 and now lives and works in Brisbane. He has a Bachelor of Arts from Queensland College of the Arts and was the 1991 Moët Chandon Australian Art Fellow. Bennett was also the 1996 Australian National University Creative Arts Fellow. He won the Redlands Westpac Art Prize in 1997.